A refinery is a place that converts raw materials into products of value. That’s why it seems the perfect name for The Good Guys new purpose-built leadership and learning centre, chief people officer, Jaime Ehrhardt told L&D Professional. “The Refinery is a place where our team members are able to learn, grow and develop… and refine their skills,” Ehrhardt said. 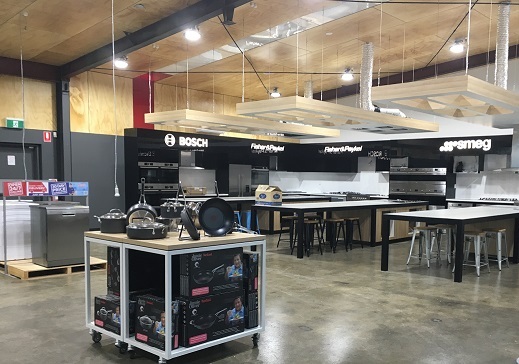 The training centre is located in Melbourne’s northern suburbs and is designed to provide team members (from the stores and support centre) with a space that fosters creativity and learning. “It is a place for team members to learn, excel and become the best versions of themselves by refining their skills through experiential learning and immersing themselves in their own development,” said Ehrhardt. The centre was designed to allow The Good Guys to create experiential programs that leverage live environments, including a mock store, point of sale and Concierge desk and a fully functioning test kitchen. It also includes a range of spaces to create diverse learning environments, such as workshop spaces of varying sizes, auditorium seating, a chill-out zone, a library and an outdoor inspired café. Ehrhardt added that The Good Guys have learnt over the years that remarkable skills are best acquired by having a learning hub like The Refinery. This is because it allows them to create experiential programs, while having spaces that nurture creativity, collaboration and innovation. “We know that our team members are the key to our success and critical to our competitive advantage,” Ehrhardt added. Ehrhardt added that the Refinery is a "tangible representation and symbol" of The Good Guys investment in their people and their “commitment to being a true learning organisation”. However, it is only one piece of their development portfolio. While not all team members may get an opportunity to participate in learning at The Refinery, they will be finding ways to share the programs they develop through their social learning platform. In order to come up with the design of the training centre, they looked at what other companies were doing around the world and what “best-in-class looked like”. “Then we challenged the thinking so that what we built would deliver the best experience and outcomes possible for our business,” said Ehrhardt. “When it comes to learning and development and what is possible at The Refinery, we are only limited by our imagination.